...U.S. unemployment will never fall below 5% during the next twenty years. If the rate falls below 5% before September 1, 2033, he immediately owes me $10. Otherwise, I owe him $1 on September 1, 2033. The unemployment rate in January dropped to 4.9 percent. Never the less, Tyler Cowen feels that he's the one who won the bet. The participation rate certainly doesn't, prima facie, appear to have recovered at all from the recession, and since this determines the denominator in the unemployment rate calculation, in Cowen's mind this means he was right overall but merely didn't anticipate that workers would actually drop out of the labor market. But it's still not that simple. The peak year for baby boomers was 1947 and births remained elevated until 1960. 1947+65=2012, which means that we hit a big wall of retirees at the same time as the recovery from the great recession—labor force participation rate was always anticipated to decline over this period. No doubt some baby boomers retired early because of the economy in 2009—realistically, no one who retired early at 62 is going to rejoin the labor force now that they're 69. In this respect, recessions have a ratchet effect on labor force size that make the recoveries look slower than they really are. I think that ratchet effect is most of what we're seeing in Cowen's graph here. One way to adjudicate this is to look at pre-recession projections that estimated what would happen to the labor force as a result of demographic trends alone. These projections aren't perfect—relevant factors could have changed since then—but they are very clean in the sense of being totally immune to our current biases about the recession and recovery since these were not known at the time. BLS has such a projection dating from 2002: they estimated that aging of the baby boomers would cause labor force participation to fall to 64.6 percent by the end of 2015 and that further aging of the population would eventually reduce participation to 60.2 percent by 2045. 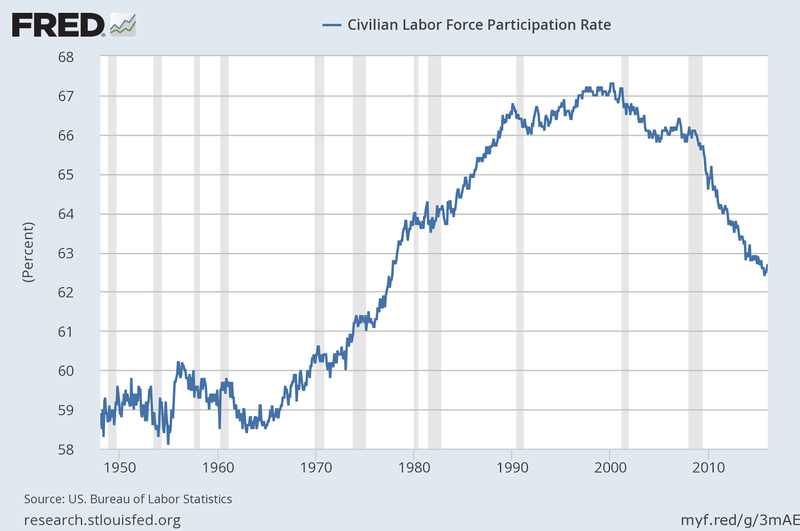 The labor force participation rate is now 62.7 percent. That suggests that at least half of the fall in labor force participation was just normal population aging. Combined with the ratchet effect described above, early retirements could explain all of the fall. My real point though is not to explain that Cowen is wrong about the labor market but that Caplan and Alex Tabarrok are wrong about betting. Tabarrok declared that bets are—pardon my language—"a tax on bullcrap," and force people to reveal their true beliefs rather than cheap talk. And yet here we are with Cowen and Caplan both declaring themselves winners on the opposite sides of the same bet. I wrote at the time that Tabarrok and Caplan were wrong to claim bets reveal beliefs. The problem, I argued, is beliefs are always necessarily conditional predictions. I believe the earth will warm by more than 2 degrees unless the governments of the world take dramatic action to curb greenhouse emissions, for example. A bet on the earth's warming does not reveal my beliefs about climate change, it reflects a complex combination of beliefs about climate change and geo-politics and lots of other things. My beliefs about what the economy will do (not fall in recession) are conditional on my unrelated beliefs about what the Fed will do (not raise interest rates too quickly), among lots of other things. Oh, sure you could make conditional bets. Cowen could have bet that unemployment will not fall unless labor force participation falls. Highly conditional bets will usually not payoff either way though, so they don't actually tax incorrect claims. In this case, if Cowen had made such a bet, there'd be no payoff since both Caplan and Cowen's positions allow that unemployment and labor force participation falls. Moreover, listing out every single factor that weighs in your belief system simply isn't practical. Ultimately, the problem of identifying beliefs through bets is exactly the same problem as identifying causality through econometrics. Econometric models, after all, do nothing more than generate predictions about the data, which we then try to use to form beliefs about the data-generating process. And that's really hard and doesn't work out a majority of the time.